Current Me: Not surprised that Activision will be making Call of Duty a subscription game. Near Future Me: Not surprised by the backlash against a bunch of money grubbing suits trying to milk gamers for all they've got. Far Future Me: Not surprised by the obscene amount of money Activision makes from Call of Duty subscriptions. I didn't play COD in the past and I won't in the future, so I don't have a horse in this race. But you can see this coming, right? © 2011 Marty Runyon. All rights reserved. I am now two weeks into my bonding time with my new daughter. Amazingly enough, she has only required 99% of my attention. The rest of the time I've actually been able to play some games. Yes, some of that is Zen of Sudoku because I can play it one handed. But in those rare instances that I have two hands free, I've been squeezing in as much gaming into fifteen and twenty minute blocks as I can. LA Noire - The big console release of the moment, I've been looking forward to LA Noire since I first heard of it and I'm not disappointed. I enjoy the investigations, as well as the occasional opportunity to chase dudes and shoot them. I am, like many people, having trouble with the interrogations. But I like messing them up just as much as I like figuring them out. When I eventually finish (and it will be eventually at this point) I'm looking forward to going back to try various cases again to see how they might have played out differently. Baldur's Gate Dark Alliance - When we set up the loft in our new house, one of my goals was to turn my corner into a retro console station. So with my NES, PS2, and Xbox all set up, I decided to pop in an older game that I haven't played in a long while. In this case, it was Baldur's Gate Dark Alliance. It's amazing how well the game holds up, especially compared to modern versions like none too impressive Dungeons & Dragons: Daggerdale. I didn't get too far into it yet, but it was nice to remember how great it was. World of Warcraft - I finally redeemed my free seven days to return to WoW. It is amazing how much I missed that game. Since I abandoned my mage at the launch of Cataclysm in favor of my paladin, I decided to go back to her and see some of the what I missed before. In this case, I took Ashlynh to Vashj'ir, the underwater zone. Although I was expecting some vast, oceanic wasteland, Vashj'ir is a tightly focused and dense zone. In other words, just like a new WoW zone. I'm not sure why I was expecting different. This is a good thing, though, since these tight zones are Blizzard's forte and I've really enjoyed my seven days. In fact, when I'm sure I have time, I will be resubscribing again. Everquest II Extended - Speaking of returning to older games, I jumped back into EQ2X as soon as the servers came up to take advantage of the bonus experience week. Since I also temporarily have a gold level account, I pushed my AA slider over to 100% and hit up some alternate zones. I quickly wrapped up 12 AA points in the little time I had. I've read other people decrying how vast the game is, but I actually enjoy having so much to discover about the world. Maybe that's because I'm a seasoned player and it would be imposing to a neophyte, but those people aren't going to play anyway. Rift - Actually, I haven't been playing Rift at all. In fact, I've cancelled my subscription. There is still a month to go in my ninety day sub, but I'm not sure I'll even be using them. I enjoy the game, but I have other things on my mind. Champions Online - Speaking of which, I haven't been back to CO for too long. I haven't even tried the latest adventure pack, Resistance. However since the first comic series, Aftershock, is starting (tomorrow? ), I'm going to be correcting my error soon. Star Trek Online - When I first tried STO, it didn't click for me. But then Steam put it on sale for $3.75, so I have to give it a second chance. I look forward to seeing all the changes that have happened over the last year. Although, I haven't had a lot of time to play, you can see that I've been taking advantage of the time I have. What have you been up to lately? For the Ythetian marriage rite, see Ritual Of Connection (marriage). Also referred to as Anchoring, the Ritual Of Connection is a spell that tethers the spirit of the magician to that of another person. So long as the spell is in effect, each person has an absolute sense of the location of the other across any difference and upon any plane of existence. As well, any strong emotion will be transmitted along the connection, though the emotions are attenuated by distance. Magicians have long used their abilities to teleport themselves to anywhere their imaginations could carry them. However, while teleportation can be safely made to a specific destination over reasonable distances, the risk of the spell going off target magnifies as the distance from the destination increases. Some magicians mitigate this by binding their spirit to the destination magically, but this has various drawbacks. Famously, one magician bound himself to his tower, only to have it destroyed and the stones scattered for miles around. Since the binding spell unexpectedly attached itself to one particular stone in the tower, the magician found himself constantly teleporting into the home of a poor tenant farmer and his family. Instead, magicians now bind themselves to another being. Since these connections are bidirectional, the accuracy is perfect over much greater distances than even the destination binding allowed. The spell generally takes half an hour to cast. The magician and subject stand, sit, or lie within a magic circle for the duration of the ritual. There is a short incantation spoken at the beginning of the ritual, but the major of the time is spent in mediation as their two spirits are attuned to one another. The actual duration of the ritual can vary from as short as ten minutes to as long as three hours depending on how willing the subject is to participate actively in the spell. The spell itself will last a number of years depending on the ability of the casting magician and will linger after death. Traditionally, subjects are deprived of all garments for the duration of the ritual. However later research has demonstrated that clothing does not interfere with the spell in any way. It is assumed that the Ebon Keep mages were dirty old men who would devise any excuse to spend time with a naked woman. Once again I find myself eager to write about comic books. Here are the books that crossed my threshold recently. Warlord of Mars issue 6 - I've been a fan of Edgar Rice Burroughs' Barsoom series even since I discovered it on Project Gutenberg. So when Dynamite announced that they would be releasing a comic based on the series, I had to give it a try. Six issues in, I am very happy with how it has turned out. Warlord of Mars does a good job of capturing the feel of the original stories (much like Busiek and Nord did with Conan) while bringing to life the world quite closely to the one Burroughs described, right down to the costuming. In this issue, we find out more about the Green Martian, Sola, and John Carter finally admits his love of Red Martian princess, Dejah Thoris. It has been a while since I read A Princess Of Mars, but this comic evokes that story very well and I'm looking forward to reading their continued adventures. Sigil issue 2 - The second issue of Sigil ends right where the last ended, with Samantha Rey and the crew of El Cazador under attack by another sigil wielder. Samantha eventually comes into her power and leaps around in time (with another unfortunate trip to her school and the tone-deaf writing of the bullies) before returning to El Cazador to resume the fight. I wonder what Marvel intends for these books once the series finishes, especially since it will take four issues to end this origin story. But I'm enjoying it enough to see where it goes. Ruse issue 2 - Of the two CrossGen books, I feel like Ruse is the most successful. While the first issue reintroduced the series, this issue gets into the heart of the mystery and action that I remember from the original series. Archard and Bishop are great partners, each playing off the strengths and weaknesses of the other. While the issue was good, the cliffhanger (a very shocking one for a Victorian era mystery) has me eagerly awaiting the next issue. Danger Girl and the Army of Darkness issue 1 - I have a soft spot in heart for Danger Girl. It is the one comic series that I treat as a collector instead of just a reader. I do like the series, even though it lost a lot of its charm after J. Scott Campbell turned over art duties to other pencillers. However, they found a decent replacement with this new series in Chris Bolson. I could try to explain the plot, but there's now point. Danger Girl has always been an action movie in comic form and this issue is no different. Since it is the first issue of six, it is primarily set up, but it's the kind of gun fire and explosions set up that you normally get in a James Bond movie. The Army of Darkness universe seems like an excellent fit for the occult mystery of Danger Girls past, so I expect a return to classic form for the series. I received a message last night from my brother telling me that Patch 1.2 for Rift murdered the servers. That didn't sound great so I waited until this morning to patch up and check out the game. Not that I had time to play, but there was something in particular that I was curious about. Sure enough, when I logged in there were two letters in my mail box informing me that I had earned the first two Ascend-a-Friend rewards. 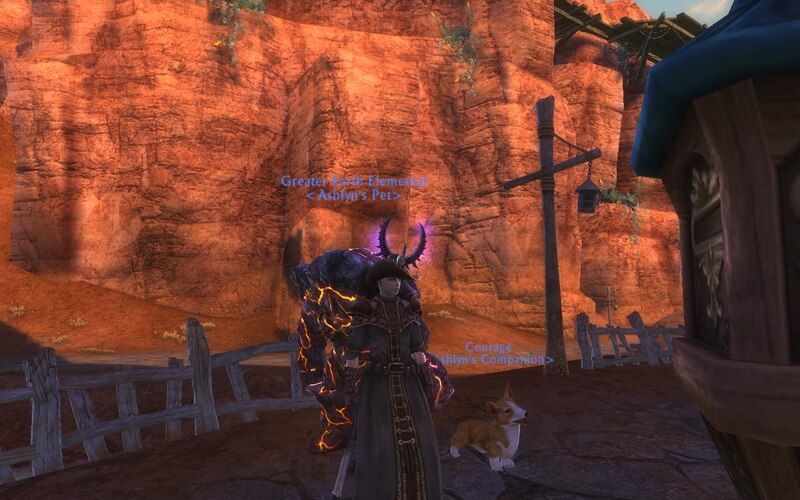 The first was a corgi companion pet named Courage and the second was a cosmetic hat called the Trailblazer's Hat. It's not mentioned on that page, but in the email I got it mentioned that they were also linking anyone who used the Allies of the Ascended from the earlier promotion. So thank you to Yeebo for buying the game and getting me some rewards. Not a bad bit of work for posting a code on your blog, eh? And yes, the entire point of this blog post is to brag. Sorry. It has been about a week since my family packed up and moved to a new house. Just Monday we resumed internet service and the most that I've done with it is to make sure my virus definitions are up to date. There is too much going on and not enough time. So I'm exhausted, distracted, and I don't have the time to fire up a game. Things are slowly coming together, though. Life feels a little more normal, even with all of the changes we've been facing. We finally bought a new TV and are having it installed today. All that said, there are a few things I'm looking forward to. Rift - It has been too long since I've played Rift. There is the new event going on and I'm afraid that I'm going to miss it entirely. Even if I do miss one event, there is still so much game ahead of me that I don't lacking in content. I'm not sure if the 3-month sub was the right option for me anymore, but I do appreciate that the game will be there when I come back. But I'll probably go a month at a time from here on out. Dragon Age 2 - A few weeks back I picked up the 360 version of DA2 for the grand price of $20. But without a proper television to play it on, it has languished on the To Be Played pile. Hopefully now that we are returning to the twenty-first century monitor-wise, I'll be able to see what Jayedub likes about it so much. LA Noire - Of all the games on this list, this is the one to which I am most looking forward. As a huge Raymond Chandler fan, getting to walk around that world and solve crime is my holy grail. I have watched all of the videos, read all the articles, and preordered from GameStop so that I can get the additional case. All this anticipation could be setting me up for a huge let down, but I think this game will turn out all right. I can't wait to give it a try. Duke Nukem Forever - I know. I mean I really know. As a modern, mature human being, I should be shocked and offended that this game even exists. Screw that. I just want to shoot dudes in the old school way. I loved Duke Nukem 3D back when it first came out and I want to see what they've been wasting their time on all these years. And I plan on having fun doing it. World of Warcraft - I just got a email from Blizzard offering me seven days of game time to see what's new in WoW. I'm thinking about taking them up on the offer. I even reinstalled the game, even though I didn't redeem the trial. I don't know how long I will stay. I may not even play the entire seven days. But I'm interested enough to dust off my mage and take a longer look at Cataclysm. I'm sure there are other games to play, but that's all the typing I can do for now. I hope all is well with you and yours.